It’s Thanksgiving week in the United States which means the NCAA football season is heading towards its climax. This week will see rivalries take center stage as No. 10 Ohio State host No. 4 Michigan. Meanwhile, No. 1 ranked Alabama will welcome Iron Bowl rivals Auburn in a game that could see the Crimson Tide knocked off their perch. There is a lot to play for this weekend in NCAA football. The College Football Playoff rankings are in and teams are jockeying for position. A major upset could send one lucky team into the top four and on to play for the National Title. Alabama goes into week 13 as the top team in the nation. The Crimson Tide defeated Citadel 50-17 last weekend and are a perfect 11-0 going into the Iron Bowl. Clemson is second with an equally impressive 11-0 a record while undefeated Notre Dame is third. The surprise package Michigan Wolverines are fourth at 10-1. There is no love for Central Florida as the 10-0 Knights are No. 9 in the nation. UCF has played well this season and most recently beat No. 24 Cincinnati 38-13. If Michigan can knock off Ohio State, some insiders feel UCF can move up the rankings. But the big schools make the big bucks for the NCAA and the College Football Playoffs, so regardless of performance, don’t expect UCF to get near the top four. Auburn travels to Tuscaloosa as Alabama’s unranked opponents. Sportsbooks have Alabama as -24.5 favorites. Despite being heavy favorites, Alabama lost the Iron Bowl last season, 26-14. Auburn was ranked No. 6 when it pulled off the upset of the season. It was the largest margin of victory for Auburn since 1969. Of course, Alabama still won the National Title. Nick Sabin and his players will be looking for revenge. 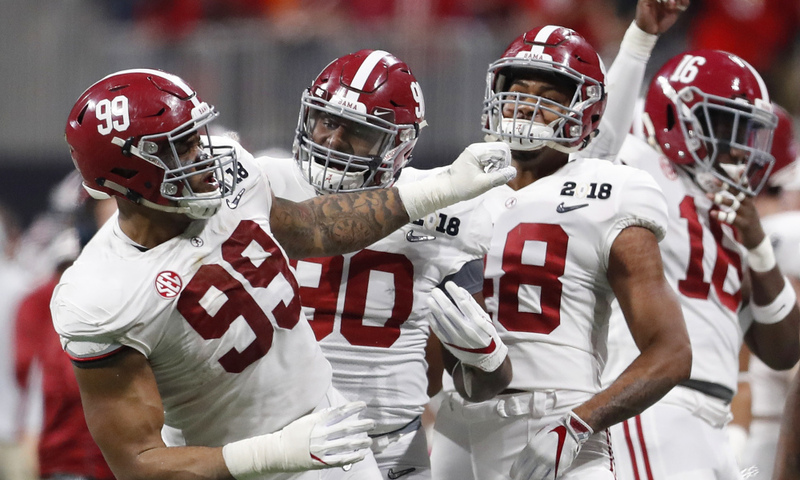 A loss may not see Alabama drop out of the top four, but it could do damage in its quest for another National Championship. Although Auburn may come out strong, Alabama will roll to a victory. Ohio State’s defense has given up points throughout the season. Thanks to the Buckeyes’ offense scoring against some teams such as Oregon State, TCU, and Penn State, many overlooked their vulnerabilities on the defensive side of the ball. Seven times this season, Ohio State has given up 20 or more points in a game. Last weekend, Ohio State squeaked by Maryland thanks to a failed two-point conversion in overtime, 52-51. Michigan won’t let the Buckeyes get away with defensive mistakes. Michigan goes into the game as the favorites and coach Jim Harbaugh will look to put points on the board early. Harbaugh knows Ohio State hasn’t been able to defend, so get ready for Michigan to go after its rival from kickoff. 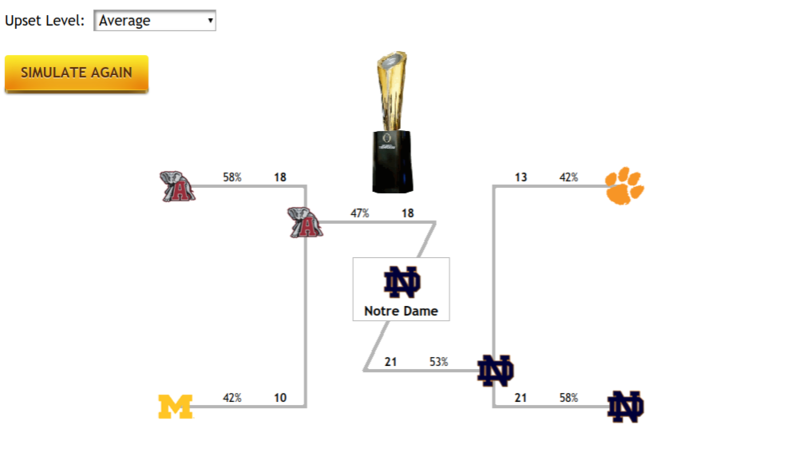 As you can see, the Playoff SImulator likes Notre Dame’s chances of hoisting the National Championship Trophy. Notre Dame is currently +700 to win the National Title. Meanwhile, Alabama is -250, Clemson is +350, and Michigan is +650 take home the championship.